When I want to indulge and treat myself like a princess, I like to go to Inda Bar for a gourmet lunch on weekdays, as it’s not far from my office on foot. They have one set lunch menu that changes every week. Make sure to check their website if it suits your palate before going (full menu: 36 CHF and single plate: 24 CHF). It is a bit more expensive than other lunch menus around town but damn, it is good. I am also a big fan of their spicy cheese naan for 10 CHF. The concept is modern and quite fancy Indian cuisine in a fabulous Scandinavian styled décor. I believe this place was created by the previous manager of the Rasoï restaurant in the Mandarin Oriental Hotel, which sets the tone of the place. It is not cheap, it is rather on the fancy side. But, the food is truly delicious and it feels good to be pampered from time to time. For dinner, you must book a table. At night, if Bottle Brothers, l’Atelier Cocktails or Maison Baalki, in the now famous drinking street for the relatively young (mid-thirties) hip crowd of bankers and traders of Geneva, are too crowded, as a nice alternative you can go to Inda Bar to sip on their fabulous cocktails (all 16 CHF). 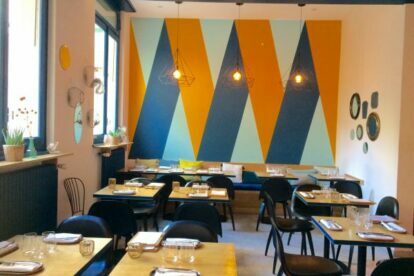 Breaking news, the owners just opened Kasbar, modern Moroccan cuisine, same concept of 3 or 4 tapas to share among friends, right next door at Rue Henri-Blanvalet 23. I will try it soon!